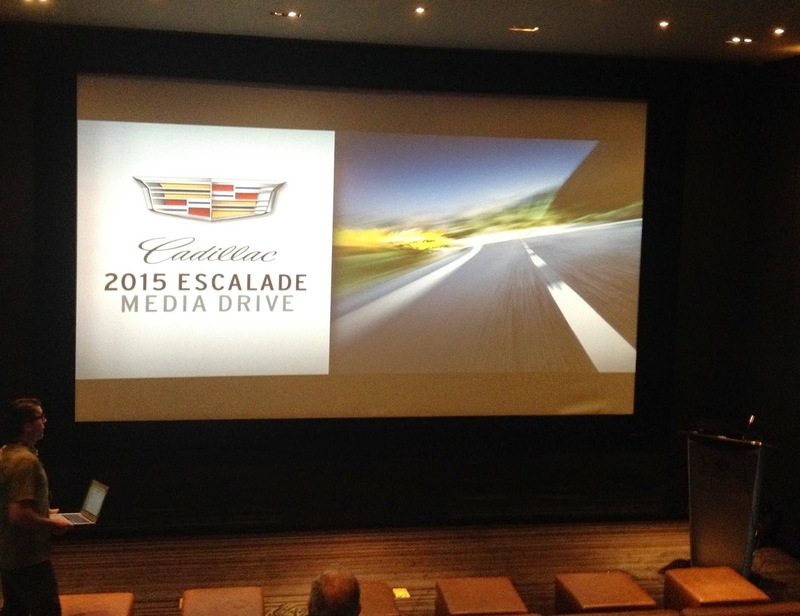 When I think of Cadillac, I think of luxury and class; and that is exactly what Cadillac Canada produced for their #EscaladeReveal Media Drive last week. I was so fortunate to be one of the few lucky lifestyle bloggers asked to join in on the Media Drive. 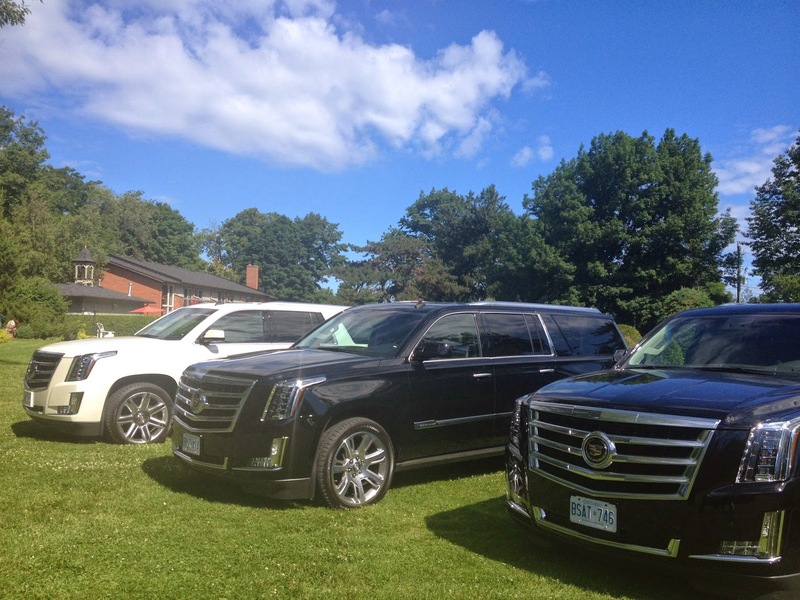 Our Media Drive included heading up north to Lake Simcoe, as well as down to the Honda Indy for a couple hot-laps in the Cadillac CTS race car and ended with a fabulous roof-top party revealing the 2015 Cadillac Escalade to a large crowd. This is the fourth-generation Escalade, and it has an entirely new exterior design - but just by glancing at it, you know it is a Cadillac Escalade. We met at The Hazelton Hotel, where we were going to be spending the night, and had a quick breakfast. After breakfast, Cadillac put on a presentation highlighting the new features of the 2015 Cadillac Escalade as well as giving a bit of a background into Cadillac and the Escalade history. After the presentation - we hit the road and headed to Briar's Resort on Lake Simcoe. My co-driver, Kat from e-luxe.com drove the first leg of our drive up to Briar's Resort, and I opted to drive back afterwards. (Which I then regretted because I got hit with a lot of traffic coming home on the DVP and of course, throughout downtown Toronto, LOL).I've driven the Cadillac CTS before, but had never driven the Escalade, nor anything this big - so I was a little nervous at first! 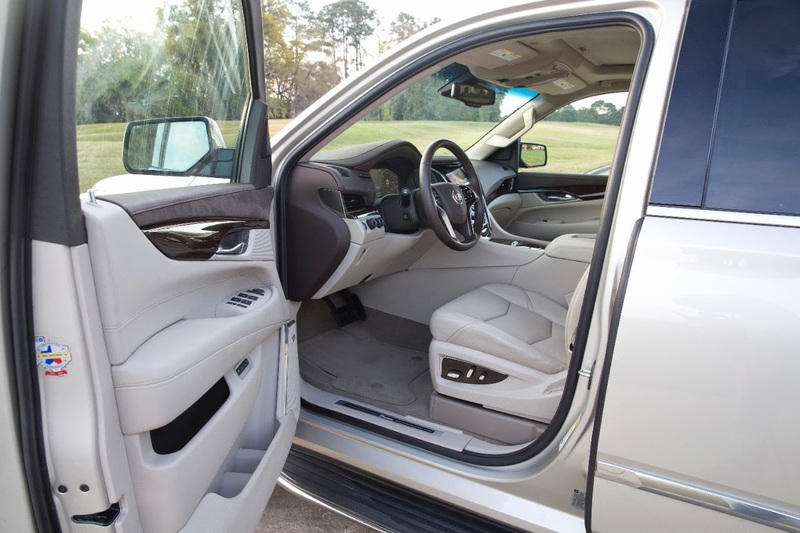 The chrome-accented side assist steps, which are standard in the 2015 Cadillac Escalade, made it a lot easier for my short self to step in-and-out of the Escalade. LOL Having already driven a Cadillac, I was familiar with the CUE and Heads-Up Display. 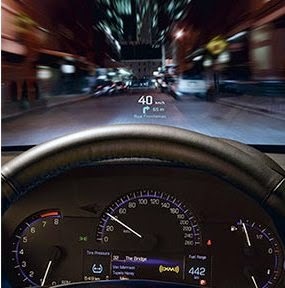 The Heads-Up Display option can only be viewed from the drivers seat and can be customized to your preferences. I always preferred to have it set to show the speed and direction I was going. This was helpful both on my Montreal trip, and the #EscaladeReveal Media Drive because the Escalde may be a large vehicle, but it sped up quite quick! Before you know it, you're going 120km on the highway! 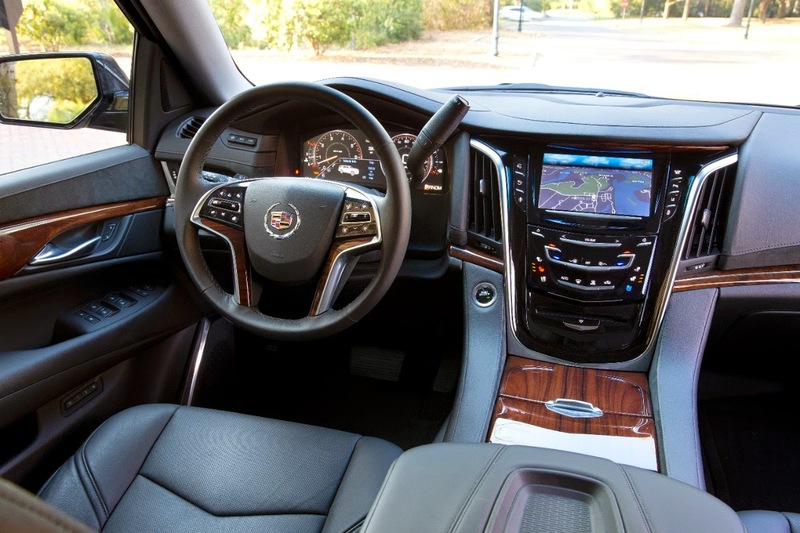 CUE – Cadillac User Experience – is standard. It is an advanced system for connectivity and control, featuring state-of-the-art voice recognition with touch controls common with the world’s most popular tablets and mobile devices. The eight-inch centre screen uses capacitive touch technology and gesture recognition, enabling tapping and swiping common to smartphones and tablets. The drive up north to Briar's Resort was absolutely beautiful! As I am usually the one behind the wheel on all of my road trip's, it was nice to be able to be in the passenger seat and just enjoy the ride and the scenery. For such a large vehicle, I wasn't expecting the Cadillac Escalade to be such a smooth, quiet ride. By the time I got in the driver's seat, I was excited! Personally, I was extremely comfortable driving the Escalade. I knew it was a large vehicle, but I was surprised at how comfortable I was behind the wheel and maneuvering my way throughout the massive lunch-time traffic in downtown Toronto. 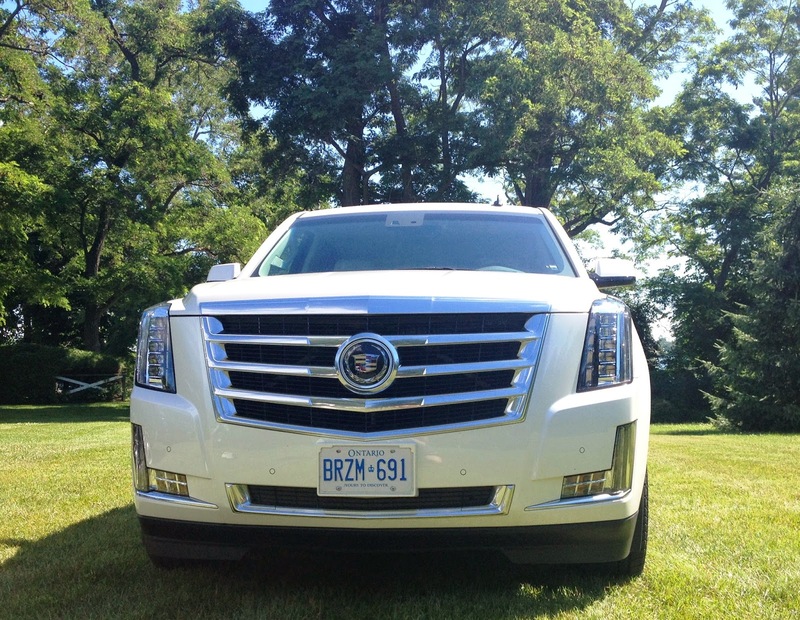 Driving on the high-speed highway, winding country roads, and slow paced city streets - the 2015 Cadillac Escalade was smooth, sleek and quiet. 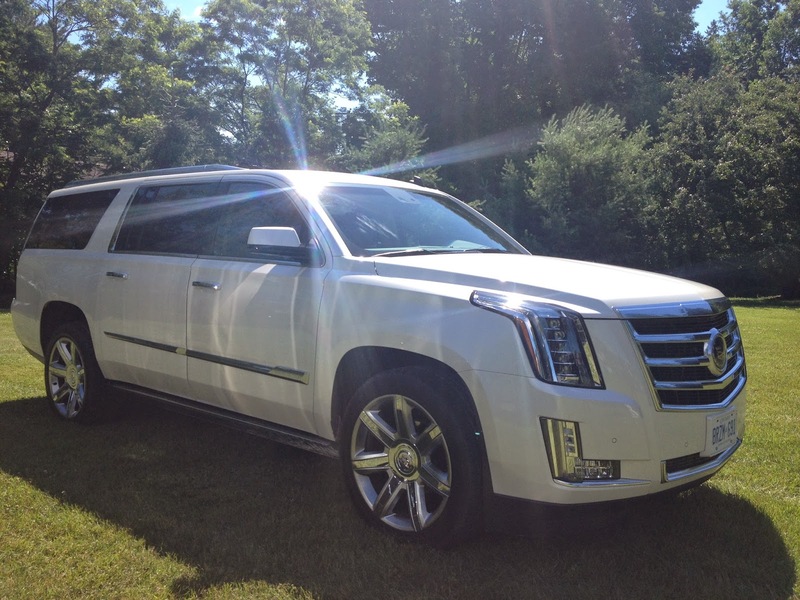 When driving to and from Briar's Resort, we opted for the smaller version of the Cadillac Escalade. 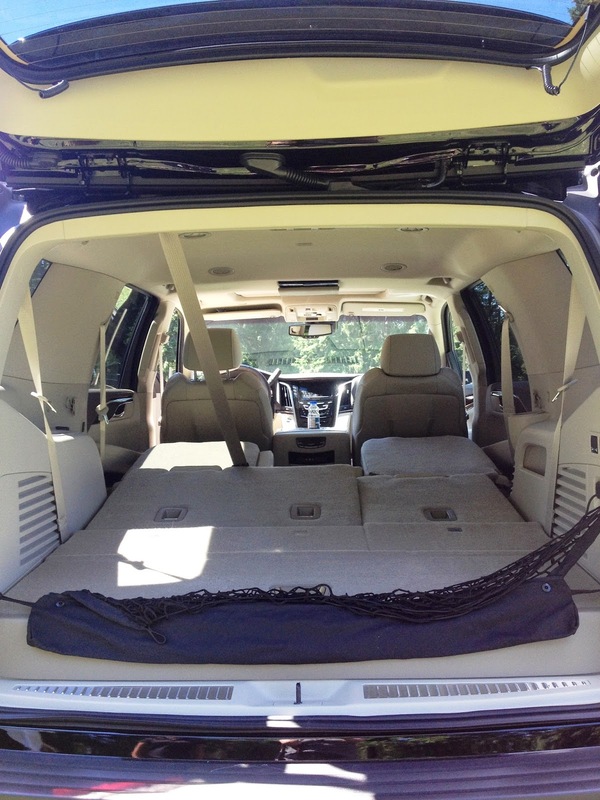 However, the ESV edition is approximately 20 inches longer in overall length, which gives nearly double the space for cargo in the back and optimizes the space for the third row seating. 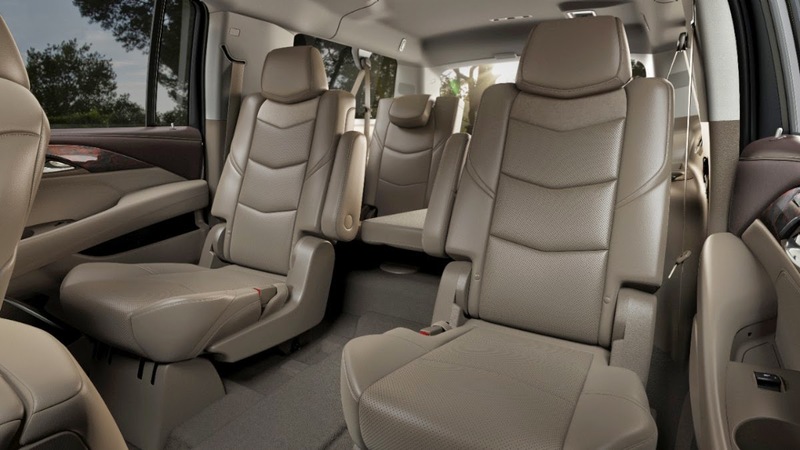 With three rows of seating, there is no shortage of space in the 2015 Cadillac Escalade. The seats were designed to be more comfortable than any before, not to mention they are gorgeous! Cadillac really pays attention to detail! Both the second and third rows fold down flat, making for even more storage space. The third row even folds flat via a power button, which makes it even easier, especially if your hands are full! Once we got back to the city we had a fantastic lunch at The Chase. I had been to The Chase before, but just for drinks - the last time was the #IcebergPartio event. This time, we sat indoors and ordered some food. Most of our group ordered the fried chicken...from a fish and oyster restaurant - go figure?! But I have to admit - it was delicious! We then headed onto our shuttle PARTY BUS and made our way down to the Honda Indy. We met with the Cadillac Racing Team and even got to do a few hot laps around the course in the Cadillac CTS and ATS Race Cars! That was incredibly fun....and incredibly scary! Here I am thinking I am the next Cadillac Racing Team superstar! 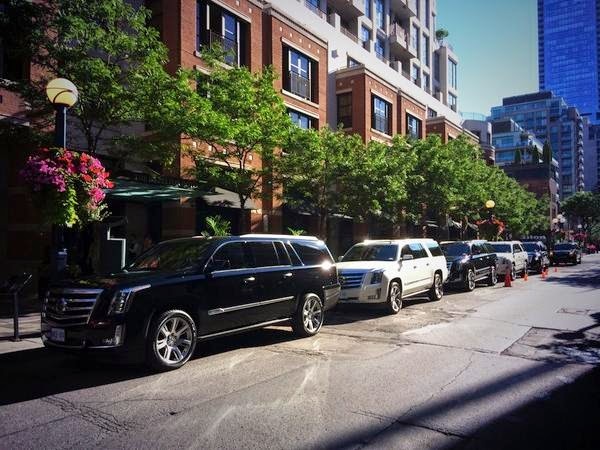 After that we headed back to The Hazelton Hotel to freshen up before the big #EscaladeReveal party that night. The Hazelton Hotel is GORGEOUS and I cannot wait to go back there, I think a staycation is in order! I had the best nights sleep I've had in months! The #EscaladeReveal party was held directly across the street on the rooftop of a parking garage. Think about it...what other facilities could really host this event? Where could you fit hundreds of people AND a couple Cadillac Escalades? LOL It was a great, albiet different, venue option but I think it worked out perfectly. 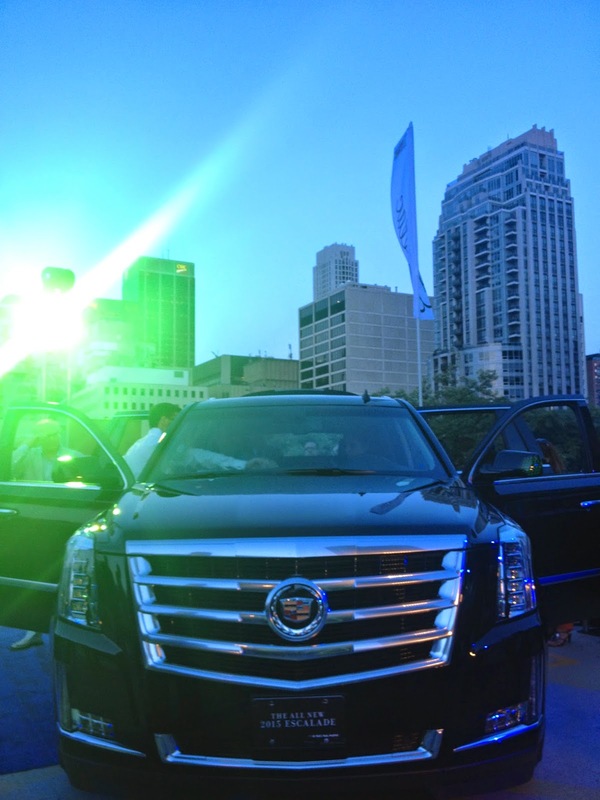 The backdrop of the Yorkville skyline was a great combination with the reveal of the 2015 Cadillac Escalade.